Adam Was Born in London, England. He started playing the guitar when he was 14 years old. Music and the guitar in particular has been his passion ever since. 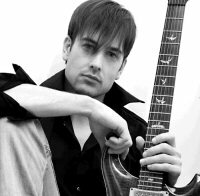 Adam has been a professional freelance guitarist/musician/composer since graduating from the world renowned Musicians Institute. His career has been varied from guitar instruction, which includes being Marshall amplifiers official website guitar teacher. Freelance music composing with various corporate clients, playing in bands including his band The Lounge Mafia, studio musician and now solo artist. His Debut album undying fire has just been released by BVF productions. It is an instrumental guitar album which is diverse in style with a focus on technical heartfelt guitar playing but with strong melodies. Joe Satriani, Steve Vai, Brian May.